T-PAK 550 System | PAK Automation Ltd. The T-PAK 550 Bag Compression and Sealing System is equipped with a flat conveyor and a foam compression belt. The bag travels down the conveyor and to meet the foam compression belt, removing the air form thwe bag without harming the product. The bag then enters the sealer to get the “Perfect Seal”. The T-PAK 550 Bag Compression and Bag Sealing System is a high quality system for increasing bag handling and sealing output. 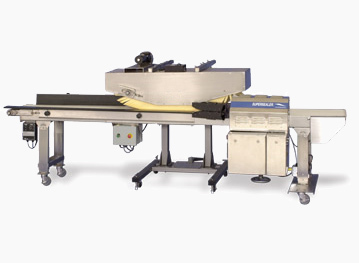 The combination of a heavy duty conveyor system with a full width compression belt and the Band Supersealer Platform or Hot Air Supersealer Platform makes this an unchallenged heat sealing system for many applications, superior in performance and speed with low maintenance cost. Electric:110 V, single phase, 20 Amp. Feed: Right to left or left to right. Optimum seal quality and aesthetics. Removes excess air from the bags. Mobility and easy access for maintenance. in food processing plants and harsh environments.